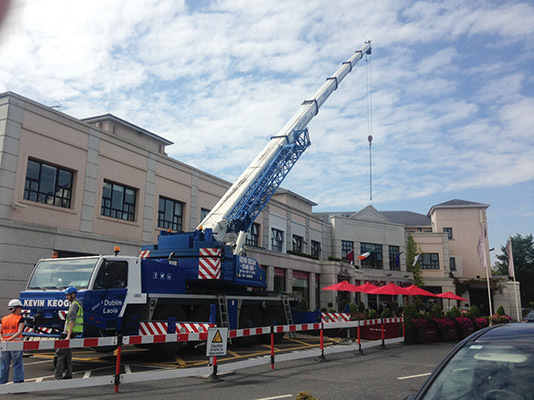 Kevin Keogh Crane Hire Ltd has the distinction of being the only crane hire company in Ireland to offer mobile, mini/spider and city cranes for hire. With depots in Dublin and Laois, the company operates a nationwide 24/7 crane hire service. Mountrath man Kevin Keogh had worked in the crane hire business for 12 years before setting up Kevin Keogh Crane Services in 2005. The business was rebranded Kevin Keogh Crane Hire Ltd last September after becoming a limited company with Kevin and his wife Elda as its directors. Kevin and his staff have a wealth of experience in all aspects of crane hire. With its diverse range of hire cranes, lifting equipment and vacuum lifters, the company can transport and install all types of machinery, plant and equipment from a single machine to a complete factory installation. No job is too big or too small for this highly-regarded family-run concern which has a growing customer-base throughout Ireland. “We have an extensive fleet of mobile cranes, mini/spider cranes, city cranes and vacuum lifters for hire,” the affable managing director explains. Kevin Keogh Crane Hire's fleet of mobile cranes range from 25-tonne mounted mobile cranes to 120-tonne all terrain mobile cranes. The cranes are maintained to an exceptionally high standard and the company works closely with the mobile crane manufacturer service teams when issues arise to make sure it is resolved quickly and to the standard recommended by the manufacturer. The Keogh team will carry out a site survey if required and recommend the most suitable mobile crane for the job. If your requirements cannot be met with one of their mobile cranes, they may be able to accommodate you with one of their mini or city cranes from their fleet. If a larger mobile crane is required, they will liaise with another mobile crane hire company and will be able to offer the services of mobile cranes up to a 300-tonne capacity. All of Kevin's mobile crane operatives are trained to the highest standards to ensure the service you require when hiring a mobile crane is delivered upon. If it's a mobile crane hired under general CPA terms and conditions or a full Contract Lift, Kevin Keogh Crane Hire can deliver the service. As health and safety is paramount within all aspects of the business, Kevin's motto is 'No Safety, No Lift'. The company's range of Unic mini cranes (also known as spider or mini crawler cranes) have the flexibility and capabilities to assist in a huge variety of lifting. They can be used on construction and domestic sites, between floors, underground, rooftops, rough terrain, indoor (no emissions) and for glass lifting and installation. They can be set up in less than five minutes, are equipped with all the necessary safety features, are radio remote controlled as standard and can be manned or unmanned (training provided). Kevin Keogh Crane Hire's fleet of city cranes are the smallest of their kind for hire in the Dublin area. They are ideal where access is limited and a mobile crane will not fit in to do the work required. City cranes' compact size, manoeuvrability and versatility make them a valuable asset for completing works in built-up areas. 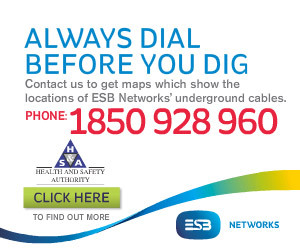 They are available for hire on a long- or short-term basis in the greater Dublin area and for long-term hire nationwide. A full service for machinery moving and relocation is also provided. From the boat, warehouse, factory floor or wherever, Kevin Keogh Crane Hire can move, lift or shift your expensive and delicate plant to its new location. The company works with a reputable transport firm to transport oversized plant and machinery. This haulier has a vast range of low-loaders, HIABs and trucks for the moving of abnormal loads. With its range of skates, jacks and all the necessary slings and chain blocks, Kevin Keogh Crane Hire is fully equipped to move most types of machinery. The plant / machinery can be picked via crane (mobile crane, HIAB or mini crane) and transported to your premises fully installed in its final location. All rigging will be carried out using the correct gear and techniques. This work can be done by hiring just the plant needed or a Contract Lift can be organised, which takes the onus off the client. It goes without saying that all operators and riggers are highly qualified. Kevin Keogh Crane Hire as well as lifting and moving machinery also specialise in handling mobile homes, log cabins, portal buildings and boats. Working for a number of sailing clubs and mobile home/portal cabin companies is major part of their business. These can be delicate and expensive pieces of kit that are in safe hands with the companies expertise and experience. A full glass / glazing installation service is another string to the company's bow. From supplying the correct lifting equipment, appropriate vaccum lifter to expert glazers, it provides the full package. With its mini crane range, Kevin Keogh Crane Hire is able to fit glass in the most intricate and tight places indoors and outdoors. The company also supplies a number of different types of vacuum lifters for different sizes and weights of glass units, and can supply vacuum lifters to fit 'curved glass'. There are a comprehensive range of vacuum lifters for hire, ranging in capacity from 50kg up to 1200kg. Larger vacuum lifters can also be sourced for bigger jobs. The vacuum lifters are also used for lifting and installing other non-porous materials such as concrete slab, stone, timber panelling, plastic and stainless steel. All of the vacuum lifters are a duel circuit system with two pumps and two different lines, so a safe system of work can be carried out. If one line should fail for some reason, then the other remaining line is capable of holding the load so it can be brought down to safety. The Woods MRT4, which has a lifting capacity of 320kg, is the most widely used vacuum lifter Kevin Keogh Crane Hire hires out. One of the company's most high-profile contract to date involved undertaking all of the crane hire work on the new Luas line / Dublin Bus bridge spanning the River Liffey from Eden Quay to Burgh Quay in Dublin for Graham Construction. “I have a very good team behind me who I can trust. They've played a vital part in making us the business we are today. I look at people working with me rather than for me, it’s a team effort,” Kevin says. For all your crane hire needs, be sure to give Kevin a call! Santa Cruz Springs, Paddock, Mountrath, Co. Laois.